A few months back, OC87 Recovery Diaries was sent a link to a song called “Bipolar-ish.” It was a funky, upbeat tune. 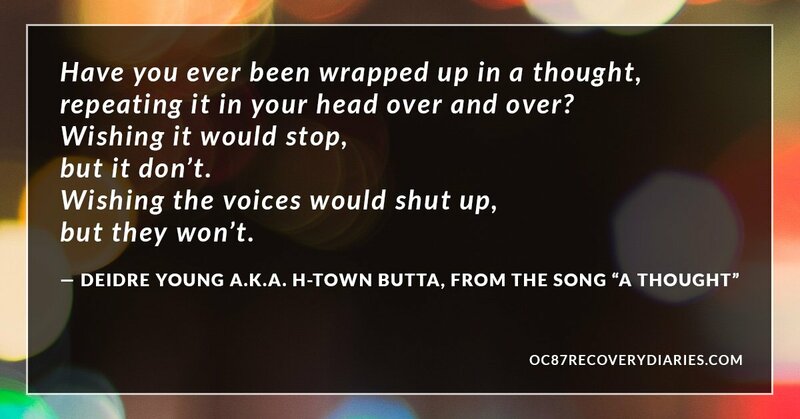 The song was credited to an artist named H-Town Butta, and honestly, it caught me off guard. I loved the song’s friendly, pop sensibility, the layers of sound in the production, and the playful — yet honest — lyrics about her lived experience. (I can’t lie, my moods do swing, but that’s OK, it’s an everyday thing, first comes the joy and then comes the sadness . . .”). This original blend of pop/hip hop sensibility with a mental health story was something that I had not heard before. I thought it was fresh, and for some reason, very brave. I followed the link to the artist’s online ReverbNation page, where I listened to other powerful songs that revealed the story of a creative person wrestling with her mental health (ie. “Need a Change,” “A Thought,” “Courage”). I was intrigued, and wanted to know more about H-Town Butta, who, it turns out, is named Deidre Young. Here are excerpts from a conversation that Deidre and I had recently about her long journey with mental health. Her life has been full of many setbacks and challenges, but throughout her darkest days, she was fueled by her passion for making music, her therapy. GLENN HOLSTEN: Hello Deidre! I’m calling from Philadelphia. Tell me a little bit about where you live and how long have you lived there? DEIDRE YOUNG: I live in Houston, Texas. I’ve been living in the Houston since the age of two. I’ve been here 42 years. GLENN HOLSTEN: Can you talk to me about your relationship with music? When did you first find music, or when did music first find you? DEIDRE YOUNG: The first memory I have when music actually touched me was when I was about six or seven years old. A song was playing on the eight-track stereo that we had. It was Lionel Ritchie — one of Lionel Ritchie’s songs or one of The Commodores’ songs. It moved me. It made me feel something just from listening to the song. I remember that moment, I cried. I actually felt something from listening to the words to the song, to the melody of the music. I don’t know what it was. I think that was to me the first sign of “Dee, there is something wrong with you!” but I was a kid, and I didn’t know that what I was experiencing what I still experience to this day. I think it had a lot to do with my mother because my mom was passionate about music. She loved music. I was inspired really by my mom when it comes to the music. GLENN HOLSTEN: Was your mother a performer? DEIDRE YOUNG: No, my mother was not a performer. She just was a lover of music. She didn’t just love any kind of music, it was music that meant something to her. Music that had a message. GLENN HOLSTEN: I was just wondering, when you’re thinking about that kind of music and your mother, what kind of artists come to mind? What songs come to mind? What are the tunes that play in your head? DEIDRE YOUNG: Prince . . . she was a Prince lover. Marvin Gaye, Michael Jackson, The Commodores. Johnny Taylor — and that’s blues. A lot of the old school music — Diana Ross, Shirley Murdock, Shirley Caesar. We got into gospel too. GLENN HOLSTEN: Those are some great artists. GLENN HOLSTEN: What role did music play in your life as you were growing up? DEIDRE YOUNG: I would get lost into the music, into the melodies of the music that people played. I loved Diana Ross — “Forever Young.” My mom bought me a record player one year, I think I was about eight years old. At that time, you could get in the papers, the twelve records for a penny. GLENN HOLSTEN: The record club. DEIDRE YOUNG: Do you remember those? GLENN HOLSTEN: Oh yeah, the Columbia House Record Club. DEIDRE YOUNG: Yes! When my mom bought me that, I was able to get tapes and records for a penny. And that got me more into with different types of music. Growing up I was only familiar with “black people” music. That was it. R&B, soul, that was it. When I was able to venture out and of course during me growing up — I was in a hospital, a mental institution and was exposed to a lot of people. When I was in the hospital, I went through music therapy and that enhanced it even more for me. The music has just been a part of my soul. GLENN HOLSTEN: I’m hearing about a journey with music and I’m also hearing about a journey with mental health. Can you talk to me about your younger years and when the challenges that you live with now surfaced? DEIDRE YOUNG: I had a rough childhood growing up. When I was a child, me and my mom and my sister, we were severely abused by my first stepfather. They said that the trauma that I suffered as a child is what triggered my bipolar disorder and my mental health issues. When I was about nine years old, I became self-destructive. I didn’t want to be here anymore. I would have obsessive-compulsive thinking, repetitive thinking. When I was a child, I had what they called a photographic memory. I remembered everything to a tee like it was a picture being taken. All the things that every happened to me would keep playing back to me in my head so by the time I was nine years old, I was like I don’t want to be here anymore. I don’t want to be abused anymore. I don’t want to be assaulted or taken advantage of so I tried to kill myself. I would hurt myself. That’s when the voices started and they were telling me that this was what I needed to do so I would. They said now you’re going to feel better. I know it hurts but you’re going to feel better. That’s what started off with my self destructive behavior, was scratching my skin off and then they put me in a mental institution when I was eleven and I was there for six months, and then I got out for six months and then I went back in for six months, and I got out for a month-and-a-half, and then I went back in. The last time I was in the hospital, they kept me there for a year and seven months. GLENN HOLSTEN: How long ago was that? DEIDRE YOUNG: I was fourteen. GLENN HOLSTEN: Wow, that’s a big chunk of your childhood. DEIDRE YOUNG: Most of my teenage years I spent in and out of mental institutions and therapy. GLENN HOLSTEN: Was music something you were holding onto then or did that come back to you later? DEIDRE YOUNG: Actually going into the hospital and being exposed to music therapy assisted me, it actually grew my desire for music. It actually opened my eyes to the music that was out there because at that time, I had only heard 102 (the radio station in Houston that played soul music) Really, literally. That’s all my parents listened to, that’s all I knew about. GLENN HOLSTEN: So you were exposed to new kinds of music in hospitals? DEIDRE YOUNG: That’s right. I was exposed to what at the time I called “white people” music. That’s when I found out I was a big fan of Suicidal Tendencies. I found out about Led Zeppelin when I was in the hospital. “Stairway to Heaven” that was, oh my gosh, is “Stairway to Heaven” by Led Zeppelin? DEIDRE YOUNG: Yes, see that’s when I started getting into rock and pop. I was like, “Wow I never heard this music before.” I heard about Depeche Mode, “Somebody.” That song moved to me to where I would listen to that song over and over and over and over again. Even as a child when I first heard it, I knew that that was what I wanted. That one song described how I wanted to be loved but I had never experienced that feeling, the way that song talks about. I will almost like . . . This was music that nobody in my family had ever heard. You know, Metallica, “Master of Puppets” — oh my gosh! I’m telling you, I went from listening to Lionel Ritchie, The Commodores, Michael Jackson and all of that to Suicidal Tendencies, Metallica, Led Zeppelin, and Kiss! I started listening to those things and they started shaping me. It’s weird but it took me to another place. GLENN HOLSTEN: It was opening your creative spirit even further, don’t you think? DEIDRE YOUNG: It did because when I listened to rock and heavy metal, that music gave me an understanding that there is more out there than what you know in your house. Being in therapy, being in mental institutions, and being around other people that was also suffering from mental issues and we all got together when it came to that. Music shaped me. GLENN HOLSTEN: When did you start making your own music? DEIDRE YOUNG: You know what? I’ll tell you when I started making music for other people. I used to make tapes. It started off listening to the radio, finding the right song and as soon as that song came on, you hit “record” on your tape recorder. I started making mix tapes, that’s what it started out as. When I started doing my own music, that was a challenge for me. Not just to do my music, but to let other people hear it. My music isn’t music that you’re going to hear on the radio. My music has become my therapy. I started making my own music about 15 years ago. A friend of mine came over and said, Dee here. It was a bootleg Fruity Loops program. Have you heard of Fruity Loops? DEIDRE YOUNG: Fruity Loops. Now they call it FL Studio. It’s a music program that comes with everything that you need, the basic sounds. You can do your own mixing and mastering. You can do everything in Fruity Loops. I literally started from scratch. It took me a week to figure out how to make that program make one sound! GLENN HOLSTEN: Was the first song a song of self-expression, the first song that you created, was it about your journey? Did you start that way? DEIDRE YOUNG: No, at first I started making instrumentals. The first actual song that I did, I have never played it for anybody. I’ve never shared it with people. It was about a relationship that I was in with this woman that I was in love with and we had been together. She had lived her life but she was my woman for ten years. The first song that I actually put my vocals was to her. Actually, it was an expression of what I was going through with her because I thought I had just lost the love of my life and I did. She was the love of my life. We can get pretty deep and in depth with people. We broke up and I didn’t understand it. That was a really hard time for me. Then I relapsed on drugs. I used to be a drug addict. Music has helped me get out of so much. GLENN HOLSTEN: It’s actually incredible and inspiring. Where do you do your recording? DEIDRE YOUNG: At home. Everything I do is in my apartment. I have a little one-bedroom apartment. I have all of my studio equipment in my living room. GLENN HOLSTEN: Do you perform outside your home? GLENN HOLSTEN: I heard it today. Loved it. They say I have a personality disorder that I’m schizophrenic or whatever. I found that I’ve come to terms with the fact that I do hear voices. If I get to a certain level and I start flipping out, my personality will change. With my music, when I would have an episode –I don’t want to say “allow” — but when my other personalities come out, they want to get on my songs too. GLENN HOLSTEN: It certainly is a unique gift that you have. GLENN HOLSTEN: All the tracks are you? DEIDRE YOUNG: Yeah, all of those are me. There’s nobody else on any of those songs. GLENN HOLSTEN: I actually thought that you had guest artists with you. I think you’re very talented. DEIDRE YOUNG: Thank you. I wish I could get paid for it! Oh, wow. That would be great. You can download it for free. It’s crazy because I never think that any of the things that I’ve done was worthy of money. “Who is going to pay you for this, girl?” I’m like “OK, if you all want to listen to it, go ahead. And people do listen to it. I’ve gotten a couple of thousand plays. It took me a minute to accept the fact that I was allowing people that I don’t even know to hear it. At the same time, it was … Anytime I put music out on my page it was because I was having a moment. I was literally having a bipolar moment and I would post it. Then I would be like, “Oh my God, Dee, did you post that for real?” I was like, “I did.” Okay, well I’m going to leave it there. Somebody will have to come and listen to it. GLENN HOLSTEN: I think that you’re very brave. Don’t you think it’s a brave action? DEIDRE YOUNG: I think that yes, it was pretty bold, it was pretty brave. When I’m bipolar, I’m full-fledged, I used to be really, really out there. I’ve tried very hard to calm down. My music is what kept me from getting in trouble. Instead of reacting and leaving and going out and having affairs and all of that, I would just stay in front of my computer and put it into my music. Usually, the songs that I’ve done usually were one take. The last one I posted on my ReverbNation page, it’s called “Bad Dreams.” That one I woke up at 2:00 in the morning and I did that whole song in 30 minutes. Created the whole song in 30 minutes. GLENN HOLSTEN: Do you have any dreams for your music? Do you allow yourself to think about what you’d like to do with it in sort of a big way? DEIDRE YOUNG: No, I guess I lack self-confidence. I do lack self-confidence. I’m working on that. With my Buddhist practice, I learned about you just do the next right thing, just do it and don’t worry about it. Just do it and whatever comes from it, comes from it. My friend Barbara, she was my mentor in my Buddhist practice and she used to always tell me, Dee I love that one song where I talk about, I say you’ve got to think big for myself. That’s what I say, I’ve got to “think big” for myself, everybody ain’t thinking about big for me. That was the whole message to my song just that one little verse, that one little statement. I’ve always been told that I was crazy, that something is wrong with me, that I’m going to be this way for the rest of my life, that I’m going to have to be on medication for the rest of my life. I’m broken. They say you’re crazy, you can’t work. What can I do? 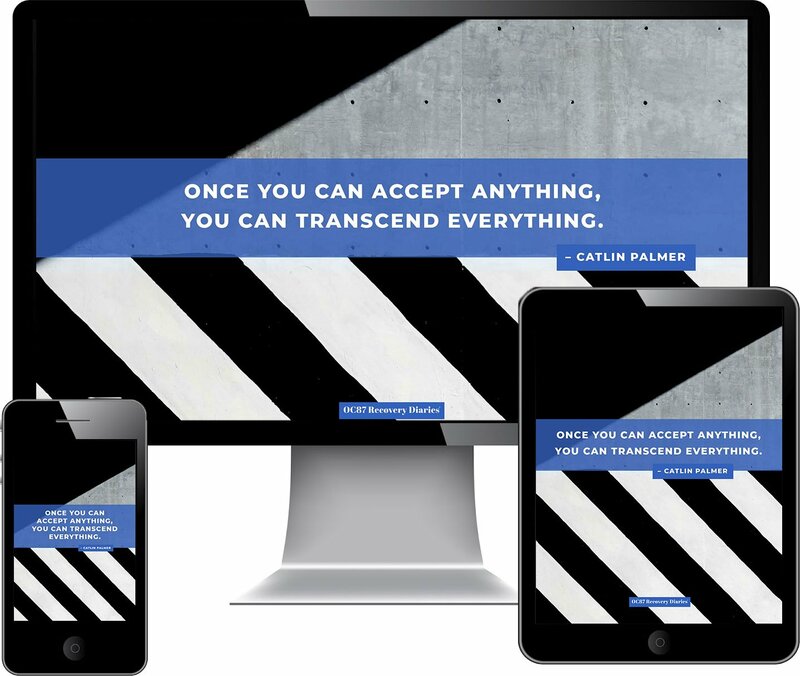 GLENN HOLSTEN: You can create. DEIDRE YOUNG: Yes. That’s what I started doing. You all say I can’t do anything, so I’ve learned to do this. Nobody taught me how to do this. DEIDRE YOUNG: I wish I could say I went to school. I taught myself everything. I first started putting my music on My Space. Most of the stuff I put on there and it would be private, nobody would even know that they were there. Then I’d have a moment, what I call my moments, and I’d just be like forget it, bam, share, share, share, share! I was like, “Oh my God, am I really going to share this?” “What will people think? You know?” Then it got to the point where I said to myself, “Dee, why do you care what people think? It doesn’t matter.” People have been judging me all my life because I can’t act like they act, or I don’t react to things the way they do. I’m no longer self-destructive — well, I am still a bit, but I no longer cut myself. I’m not a cutter. GLENN HOLSTEN: I’m glad to hear that. DEIDRE YOUNG: Yeah, me too. The last time I cut myself I think was about six years ago and it hurt. If I tell you up to that point, me putting a razor to my skin, it didn’t hurt, it wasn’t pain that I felt but that last time that I did it, it hurt. I said, “What was I doing all these years?” I did this one song about it and I’m trying to find the courage in me to post it. GLENN HOLSTEN: I think it’s interesting that you took the initiative to send us the “Bipolar-ish” song. That’s how we came to know about you. GLENN HOLSTEN: So many people lack the vocabulary to discuss mental health diagnoses like bipolar disorder, but when you start singing about it, you’re not only giving them permission to talk about it but you’re giving them a vocabulary. What does bipolar-ish mean? What do you mean when you say bipolar-ish? DEIDRE YOUNG: Bipolar, mood swinging. It’s where I was at that moment, what was in my head and there you go. For some reason, I felt an urge to share it with the world. GLENN HOLSTEN: Is H-Town Butta a name that you gave yourself? Tell me about that name. I’m Butterfly Love. Love represents the love that I have inside of me and Butterfly represents who I am, what I’ve been through. I went through a very rough time growing up and then something happened and I did go into a cocoon. Then when I was fighting my way out of that, I became a butterfly. People see this beautiful person in me and I don’t see her half the time. H-Town is of course, Houston. I had to put a little spin on it but I’m originally from Georgia. H-Town Butta, people tend to, you know they’re like what’s your show name. I’m like, just all me that Butta, H-Town Butta baby! GLENN HOLSTEN: I’m curious to hear from you, what’s a good day? What’s a really good day? 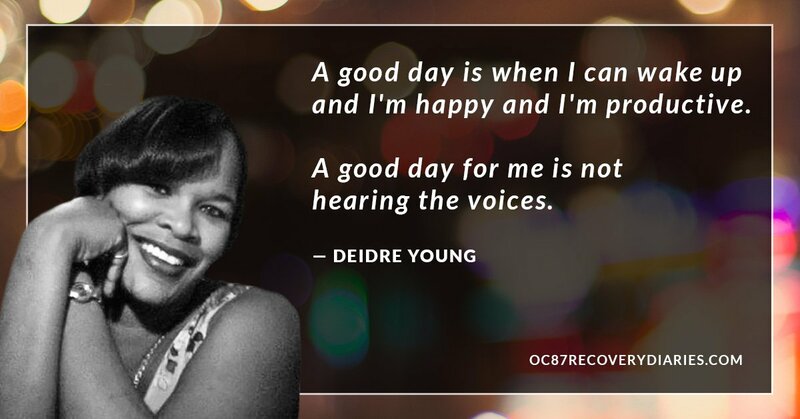 DEIDRE YOUNG: A good day is when I can wake up and I’m happy and I’m productive. I can make somebody else’s day brighter. A good day for me is not hearing the voices. Not going through the emotional swings that I go through in a day. To be able to just be okay and be still. Usually, when I’m up and about, I’m not still. I can’t be still, I’ve got to move, I’ve got to do even if it’s doing something in a circle. A good day is no worries, no mental breakdown, no hating myself because I love myself. Today I can say it, I can share with you that I love Deirdre Young. Oh my gosh! You couldn’t pay me to say that ten years ago. I wouldn’t say I love me. A good day is a day of me loving me. GLENN HOLSTEN: What do you do when you have those not-so-good days? DEIDRE YOUNG: I excuse myself from the presence of other individuals. I don’t think it’s fair that they have to put up with my breakdowns because I don’t take medication, I stopped taking medicine a long time ago. GLENN HOLSTEN: That’s very brave too. 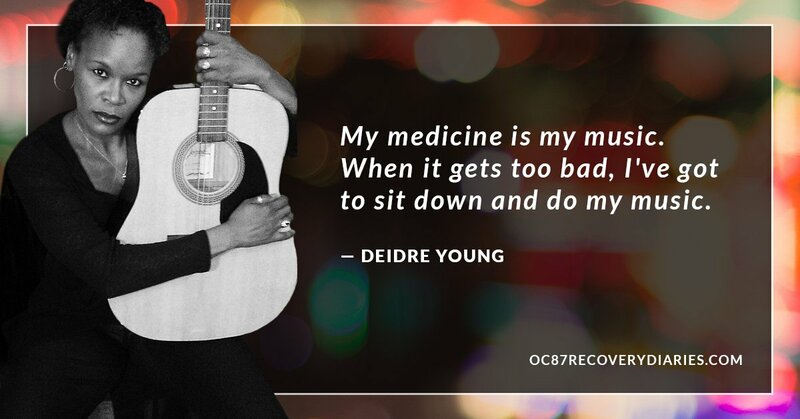 DEIDRE YOUNG: My medicine is my music. When it gets too bad, I’ve got to sit down and do my music. GLENN HOLSTEN: In addition to your music, what else in life is important to you? DEIDRE YOUNG: My son, my family. Just trying to stick around long enough to be there for people. And I help, I volunteer with the homeless. GLENN HOLSTEN: What do you get out of the volunteer work? What does it do for you? DEIDRE YOUNG: I have to say I’m a little selfish on that note. It was a way of me having therapy, of getting out to meet people. When I got on disability and got my housing, that was it, I didn’t have any more structure. I wasn’t going to therapy. Basically I was housed. My friends would call me, “Dee have you been outside this week?” I didn’t have any reason to go outside. I checked my mail twice a month. I tried to get it down to once but then I kept missing stuff, so I had to go to twice a month. I didn’t like being around people. I did like being around people but, honestly, I didn’t like people seeing me go through my issues. I would, I became a — what do they call it? A recluse? GLENN HOLSTEN: That’s the word. DEIDRE YOUNG: I actually shared with my case manager what I was going through. She said, “Would you like to do some volunteer work?” I really didn’t want to volunteer, but at that point in my life, I said if somebody asked me to do something good, I would do it. Regardless of how I felt. I started helping because I wanted to be better than what I was at that time. That got me out of myself, and got me into helping other people. I think that anytime you’re helping other people, you’re helping yourself. GLENN HOLSTEN: That’s beautiful, and true. I loved speaking with you today. DEIDRE YOUNG: Thank you. Glad … I was actually nervous, but you really made my night. Thank you so much. GLENN HOLSTEN: You made my night. Your music is great and your strength is amazing. I’m very inspired by you, and I think other people will be too. GLENN HOLSTEN: Or, you can make a song.